This article is about the alchemists in the base game. For the alchemists added by Dragonborn, see Alchemist. Alchemists are dead Dunmer conjurers found throughout Skyrim. They all wear boots and Black Mage Robes. They all carry a nirnroot, a rare ingredient, and a leveled dagger. There is one in a cell in Fort Greenwall, one in a hanging cage outside of Fort Dunstad, one at the giant camp Cradlecrush Rock, one on a rock in a river near Talking Stone Camp, and one on a sunken altar at Evergreen Grove. They can be a good source of ingredients in the beginning of the game. 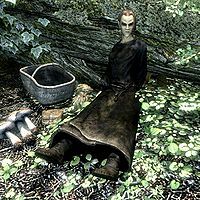 This Alchemist is an Altmer conjurer found at Clearpine Pond up against a fallen tree. She wears black mage robes and boots. She carries a nirnroot, a rare ingredient, a leveled dagger, and a copy of the Alchemy skill book De Rerum Dirennis. Beside her is an apothecary's satchel containing one common, uncommon, and rare ingredients each, with a 25% chance of containing one random potion of healing, of magicka, or of stamina. There are also two taproots and a blisterwort found beside her, along with an empty flower basket. 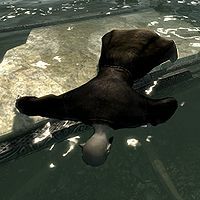 One more alchemist is found in Volkihar Keep after Dawnguard is installed, on a table in Ronthil's quarters. Strangely, both types of Alchemists know the spells Conjure Familiar, Flames, Oakflesh, and Lesser Ward, even though they are dead and cannot use them. This page was last modified on 16 September 2016, at 20:30.